Our group is actively engaging with the community, developing new tools and using new media to demonstrate the technology & science used in the detection of gravitational-waves & the emerging field of gravitational-wave astronomy. Follow us on twitter at @UoBIGWaves or @UoBObservatory to get news and info about our activities! 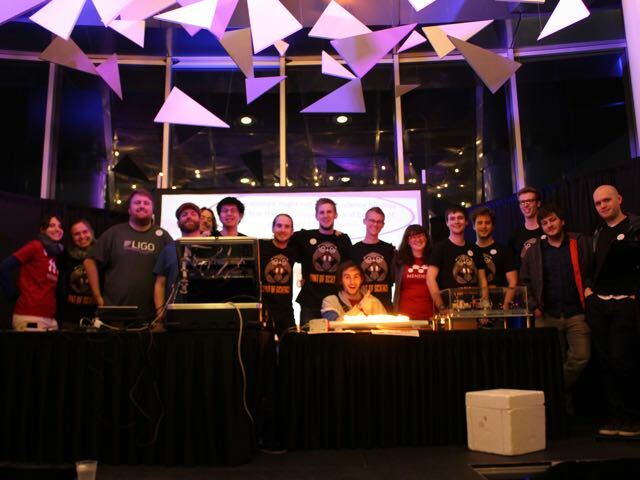 Laser Labs For Games and Apps, check out laser labs! These games will run on almost any smartphone or PC. Educational, fun and addictive! E-Book on gravitational wave detection: Simple explanations for how a gravitational wave detector works. On-line Demo's that illustrate a bit of the physics involved. Note: These are in the process of being updated! Check back in Autumn 2017 for fresh demo's. We are a very active group, regularly taking our exhibitions to schools, science festivals, open days and events. Contact us for more information! In addition, we run Astronomy In the City on a regular basis. Please come along, see our telescope and meet our expert staff. Royal Society Summer Science Exhibition 2017 We will be at this years Royal Society Summer Science Exhibition. 2017 has already been a busy year, with our group taking a leading role in several high profile events. 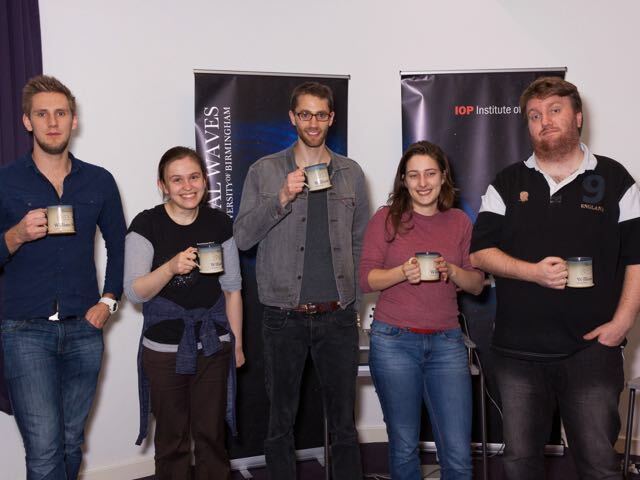 Our group took a leading role co-organising this years Birmingham Pint of Science - Atoms to Galaxies with the Space Environment and Radio Engineering Group. The event was a huge success with speakers and support from the Particle, Nanoscale and Quantum Sensors Physics Groups. Cheltenham Science Festival - Over 1500 people joined us at the festival in the MakerShack tent to 'make their own planet' and learn about gravity, gravitational waves and how we detect them. Two Astronomy In the City events have run so far this year, The Music of the Stars and the Search for New Worlds and Super-massive black holes. 2016 was a busy year for us with the first direct detection of Gravitational Waves. We supported over 16 events and 21 talks at local schools museums and science fairs. 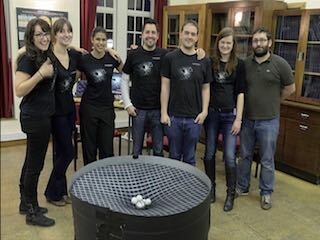 We ran 6 Astronomy In the City events, with two special events for the detection of gravitational waves. Topics ranged from the formation of galaxy's, to pulsar timing arrays and General Relativity. In support of the first detection of gravitational waves, members of the group spoke at the 2016 TEDxBrum. In addition we provided hands on interactive demonstrations (click here to see the talk!). We installed an interactive model Gravitational Wave detector exhibit in the Birmingham Thinktank Museum. The exhibit allows you to see the effect of a passing gravitational wave in real time across the device. In 2015 we celebrated the Einstein Centenary. We supported over 15 events well over 8 talks at local schools museums and science fairs. We ran 4 Astronomy In the City events. Topics included Gravitational Waves and Gamma Ray Bursts. 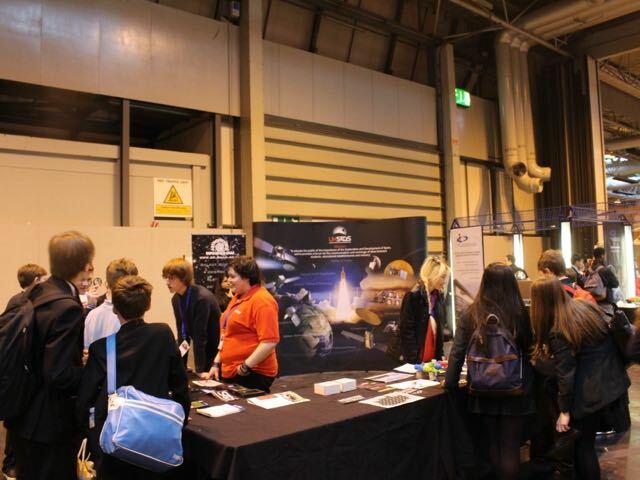 Members of the group supported UK SEDS exhibiting at the Big Bang Fair in Birmingham. Members of the group ran a meet the expert session at Birmingham Thinktank Museum to celebrate the Einstein Centenary. We took along a our LIGO, gravitational waves and gravitational lensing exhibits. We supported over 17 events lots of talks at local schools museums and science fairs. We ran 5 Astronomy In the City events. Topics included large telescopes and future exploration of Mars. 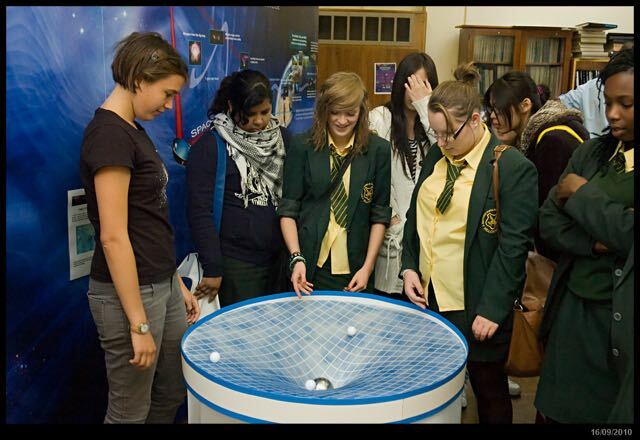 Members of the group supported Teen Takeover Day 2014 at Birmingham Thinktank Museum. We took along a our LIGO, gravitational waves and gravitational lensing exhibits; running a stand about space and gravitational waves. In addition, we had a busy summer supporting: the British Science Festival, Girls in STEM day and WINGS Space Camp. At all three we took our LIGO, gravitational waves and gravitational lensing exhibits and apps; running a meet the expert stand for people to meet with active Astrophysics researchers. We supported a number of high profile events in addition to talks at local schools museums and science fairs. BBC Stargazing Live - Looking For Black Holes with Lasers. We demonstrated our LIGO optical model, LIGO Suspension Model and Einstein' Universe along with our usual apps and games. Around 800 people visited the University to learn how to use our telescopes, make rockets, and learn about space. 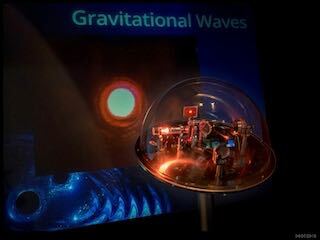 Cheltenham Science Festival - We demonstrated a stand offering an introduction to Black Holes, Gravitational Waves and the Laser Interferometer Gravitational Wave Observatory (LIGO). We exhibited our LIGO Optical Model, games and apps. The group supported the University of Birmingham Arts and Science Festival. BBC Stargazing Live - Looking For Black Holes with Lasers. In the lead up to the 2012 BBC Stargazing Live event led by Manchester's Prof. Brian Cox, we led a smaller Astronomy event at the University, supported by the BBC. Big Bang Fair in Birmingham. Several members of the group took a Lycra Universe and Black Hole Pong game to the Big Bang fair in Birmingham, explaining Gravitational waves and Einstein's theory of relativity. Cafe Scientifique at the Birmingham Thinktank Museum. Members of the group provided a public lecture. We supported a number of events including talks at local schools museums and science fairs. 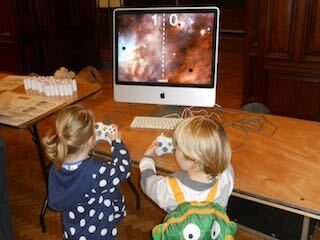 Members of the group supported University of Birmingham's Community Day, demonstrating our apps and games. Talk at Villiers Park Educational Trust. Members of the group provided a talk and demonstration of a working Michelson Interferometer. University of Birmingham Outreach day. 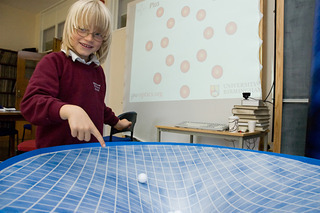 Holy Trinity International School in Worcester came to see our working LIGO Optical Layout, Demonstration of Einstein's Universe and talks from staff. 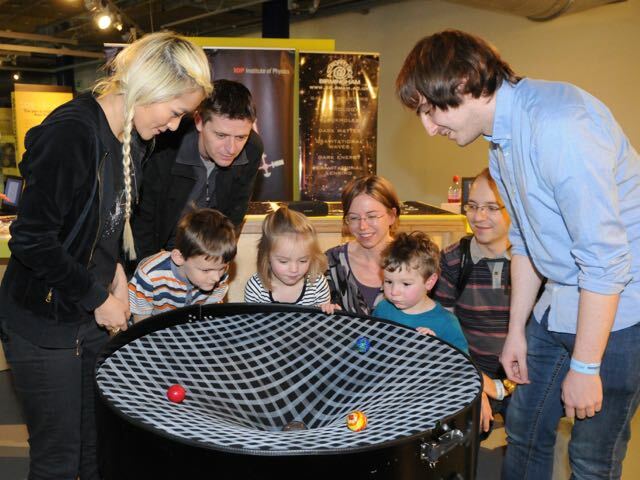 2010 was an especially exciting year as the British Science Festival came to Birmingham! We put together an exhibition entitled 'Looking for Black Holes with Lasers'. 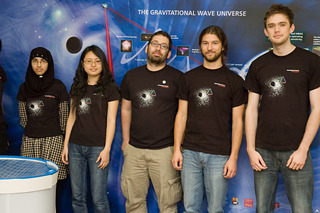 The exhibition lasted for three days and was centred around a set of interactive computer games and hands-on demonstration models of gravitational-wave detector technology; three public talks completed the program. Over 250 visitors joined us to find out how we use lasers to discover black holes by observing the gravitational radiation that they emit. For photos and more information please see the exhibition page.